The best intentions often come back to haunt you. Mission: Impossible Fallout finds Ethan Hunt (Tom Cruise) and his IMF team (Alec Baldwin, Simon Pegg, Ving Rhames) along with some familiar allies (Rebecca Ferguson, Michelle Monaghan) in a race against time after a mission goes wrong. The hype is real so get your superlatives ready. Mission: Impossible Fallout is one of the best action movies in recent cinema history. Christopher McQuarrie’s second film in this phenomenal franchise (after 2015’s Rogue Nation) is deliciously intense... and utterly breathtaking. 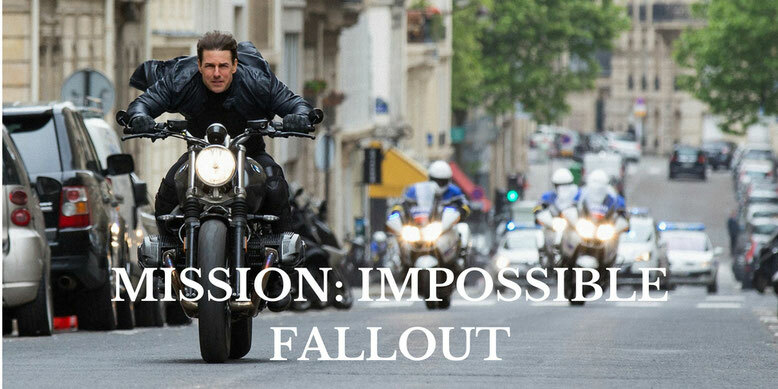 Fallout is a film made by people who love Mission Impossible for people who love Mission Impossible. Every element that we have come to expect from the series is here - and then some. Intense situations, innovative action sequences, smart writing, humour, camaraderie and (most important of all) heart. That is not to suggest that Fallout alienates newcomers. You don’t need to watch or rewatch any of the previous films (although the story does reward some prior knowledge). Despite its complex (but not impenetrable) plot, Fallout works as a thrilling standalone movie as well as a superb addition to the franchise. Tom Cruise gives another incredibly physical performance as Ethan Hunt. By incredible, I mean almost super human. I found myself wincing as I watched this fearless 56 year old actor fling himself from one action set piece to another. It’s mesmerising (particularly during one extended running sequence) exciting and rather anxiety inducing - an exceptionally committed performance. Of course, it takes a village to create these scenes and the imagination, choreography and effort involved in some of Fallout's action sequences is simply mind-boggling. Just one of these adrenaline-fuelled displays would have been more than enough for a "normal" action movie. However, McQuarrie gives us set piece after set piece. I won't spoil the film by indulging in any details, but it’s pulse-racing and endlessly entertaining stuff. Fallout is a film that demands (several) viewings to appreciate these spectacular moments. Mission: Impossible Fallout is far from the Tom Cruise show. Indeed, the most enjoyable parts of the film come from Hunt’s hilarious (“I’m jumping out a window!”) and poignant interactions with his IMF colleagues. It is wonderful to see Simon Pegg and Ving Rhames reprise their roles. Meanwhile, Rebecca Ferguson gives another scene stealing performance as Ilsa Faust. Of course, much has been said about the casting of Henry Cavill as August Walker. Or, more specifically, Henry Cavill’s moustache. It is a very fine moustache and that moustache accompanies a very fine performance. Caville’s impressive physicality complements Cruise’s action style. He also delivers the balance of humour and menace that we have come to expect from the Mission Impossible series. While the film’s undeniably impressive action scenes may dominate the conversation about Mission Impossible: Fallout, at its core, this is a movie about compassion, love and the value (and power) of lasting friendship. endearing and, amid all the destruction, remarkably uplifting. Mission Impossible: Fallout - you’ll come for the breathtaking action and you’ll stay for the heart. Fallout is by no means a short film. However, even with its two hour 27 minute running time, at no point did Christopher McQuarrie’s film overstay its welcome. Have you seen Mission Impossible: Fallout? If you have, what did you think of this movie? Let me know in the comments section below or via Twitter. You can find me @500DaysOfFilm.